This card is entered into the Crazy Crafters' Team Highlights. Click here to see all the entries and vote for your favourites. I know she see's my blog posts so, depending on how "senior" her memory proves to be, this may or may not be for my Chardonnay-loving friend! 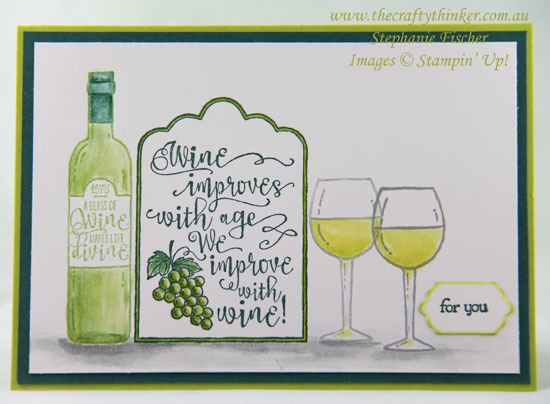 A card suitable for many occasions! The colours used are Wild Wasabi, Tranquil Tide, Lemon Lime Twist, Daffodil Delight and Smoky Slate. It's a very simple card so there's not much more to say!